notifications available for Computers & Contacts - they notify you about new service cases, new contact requests, alerts about TeamViewer integrated monitoring checks and more. 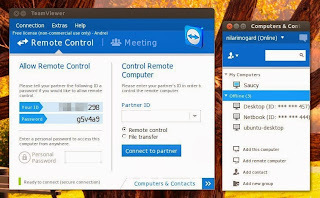 Also, there's a new design for both the TeamViewer and Computers & Contacts interface. According to the release announcement, important buttons convert automatically to a touch-friendly design when you use TeamViewer on a touch device. Not all the new features are available on Linux though. 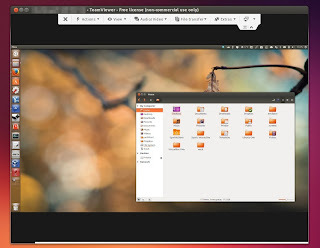 For instance, in my test (both computers running Ubuntu) I wasn't able to transfer files between the computers via copy/paste and the simplified file transfer seems to be missing. Also, opening connections in tabs seems to be a Windows-only feature. Note that older TeamViewer versions (6, 7, 8, etc.) can't establish a remote connection with the latest TeamViewer 9. 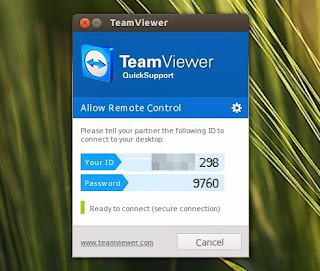 However, TeamViewer 9 users can establish remote connections with older versions.